When: Thursday, January 25, 2018 | 12:00 p.m. – 1:00 p.m. 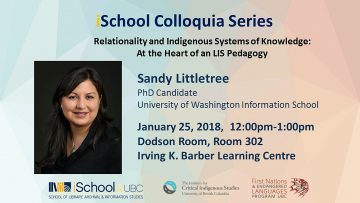 The School of Library, Archival and Information Studies (SLAIS), the iSchool at University of British Columbia, the Institute for Critical Indigenous Studies, and the First Nations & Endangered Languages Program, are pleased to welcome Sandy Littletree, PhD candidate at the University of Washington Information School, as a speaker in our Winter 2018 Colloquium program. She will be speaking on the topic of “Relationality and Indigenous Systems of Knowledge: At the Heart of an LIS Pedagogy”. The collection, classification, manipulation, storage, retrieval, movement, dissemination, and protection of information are the hallmarks of the information science field. As this field is based upon understandings of knowledge and information, and with so much at stake for Native communities’ stories, documents, and histories, the use of relationality as an intellectual construct should be critical to teaching and research in this field. This presentation explores Indigenous systems of knowledge as a framework for teaching library and information science professionals, creating a foundation in which to imagine ways to overcome mainstream systems that can limit the retrieval of Native materials in libraries and archives. Sandra Littletree is an enrolled member of the Navajo Nation (Diné), and comes from the Eastern Shoshone Tribe from her mother’s side. She is currently a PhD Candidate at the University of Washington Information School and a member of the Indigenous Information Research Group (IIRG). Her research interests lie at the intersections of Indigenous systems of knowledge and librarianship. Her dissertation research focuses on the history and development of tribal libraries in the United States. Previously, she worked as the Knowledge River Program Manager at the University of Arizona School of Information Resources and Library Science. She has developed advocacy resources for tribal libraries, produced a series of oral histories that document the stories of Arizona’s tribal libraries, and oversaw the revision of the 3rd edition of TRAILS (Tribal Library Procedures Manual). She was one of the six Honoring Generations Scholars at The University of Texas at Austin iSchool. She is a past president of the American Indian Library Association (AILA). She is originally from the Four Corners region of New Mexico, USA.